Rare and ultra fine AGL certified 2.09 carat oval Ruby, and a pair of GIA certified 1.01 carat pear shaped diamonds, D/VVS2-VS1, are set vertically in this breathtaking platinum ring. 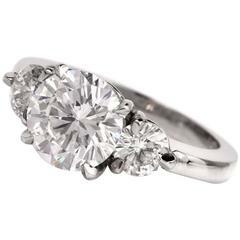 The round brilliant diamonds framing the ring weigh a total of 0.78 carats. 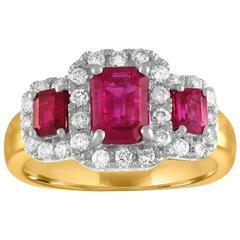 This unheated Ruby showcases superior color, cut and clarity. Hand crafted by extremely skilled hands in the USA. AGL and GIA certificates attached. Size 6. Re-sizing is complimentary upon request. This ring style can be custom ordered in all fine gemstones including, Sapphire, Emerald etc. ***Returns are accepted within 7 days of delivery and will gladly be paid by us. Rings resized upon request, may also be returned. Ruby Cocktail Rings.